Hsiung Feng II Anti-Ship Missile Display in Chengkungling. The Hsiung Feng II (HF-2) (雄風二型, "Brave Wind II") is an anti-ship missile system developed by the Chungshan Institute of Science and Technology in Taiwan. The HF-2 is designed to be deployed aboard ships or at facilities on land. An airborne version has also been developed which can be carried by the ROC Air Force's F-CK fighters. The HF-2 has ECCM capabilities and is deployed on the ROC Navy's Cheng Kung class frigates and Lafayette class frigates, as well as at several land-based sites. 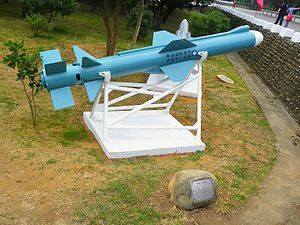 In 2000, plans were announced to replace the HF-2 missiles stationed on the Cheng Kung frigates with the RGM-84 Harpoon, but the budget for this was cancelled. In 2001 a land attack cruise missile variant known as the HF-2E was announced, mass production of the HF-2E began in 2005. There are three major versions of HF-2 in service. The first to enter service is the ship-based HF-2, with 2 twin box launcher on destroyer DD-915 first as trial vessel. Later all major surface combatant in RoCN, except the Knox, were equipped with 2 quad-launchers, plus the 7 WWII era Gearing DDGs that was upgraded to WC3 standard, from late 1980s to mid 1990s, had added a 1 quad-launcher by mid 1990s to give those air defense ships an anti-surface ability. Air-launched version appeared in the early 1990s. Carried by two AT-3B trainer/attacker and a single A-3 attacker, the small force poses little threat to the marine intruders due to its small quantity. However, the recent upgraded IDF (F-CK-1C/D) will add the capacity to carry and launch the HF-2, thus greatly enhance the air-to-surface capacity of RoCAF in future. The air launcher version of HF-2 carried by AT-3 is different from the one supposed carried by original IDF (F-CK-1A/B) prototype, due to differences in length of the HF-2 missile (better known as HF-2 Mark 3 and Mark 4), where the missile designed for one aircraft cannot fit on another aircraft. Unknown if air-launched HF-2 program is continuing at this point. The land-launch version of the HF-2 is the most secretive one, because its relation with the land-attack version of HF-2E. Fixed base versions were produced first, and all major outlying islands of Taiwan were equipped with fortified HF-2 bases in late 1990s, replacing old HF-1 bases. Fixed HF-1 bases in the main island was also being replaced with fixed HF-2 launchers, again in fortified positions. The mobile launcher version was accepted in 2005 and went to mass production in 2006. All mobile launchers, together with mobile command center (with data-link), mobile surface search radar and mobile electric generators, were kept in harden shelters and being driven out when needed. The HF-2 mobile launchers, shown in 10-10-2007 parade, was designed to be able to carry both HF-2 and the new HF-3 AShM, by leaving room for the larger HF-3 missile boxes. Same was done to the OH Perry/Cheng Kung class frigate's new HF-2 launchers after each frigate's major overhaul, starting 2001, that allows the launcher to carry larger HF-3 AShM, besides HF-2. Ching Chiang class patrol ship(total 12 built) also are undergoing same upgrade to carry 2x2 HF-2/3 anti-ship missiles. Kuang Hua VI class missile boat (31 to be built) also carry 2x2 HF-2 anti-ship missile. A submarine-launched version was planned and designed in the mid-1990s, but nothing more was heard. Selling of the UGM-84 by US in 2001 may probably terminate it. Not confirm of any submarine-launched version exist, nor US had sold any UGM-84 Harpoon to this date, or Taiwan has announced any purchase of sub Harpoon, or any submarine-launched HF-2. Although the next generation supersonic SSM, the HF-3, has recently completed its development and will start production soon, the development of the HF-2 continues. In mid-1990s the fuel for HF-2 was changed, which doubled its range (80 km to 160 km). The IR seeker was also being changed to an IR imaging seeker, which greatly enhance the IRCCM ability. Also, with the IR imaging seeker, the HF-2 was then able to attack shore targets also, with pre-stored target shape inside missile's computer, but an HF-2 land attack ability was never confirmed. In the late 1990s CSIST begin to develop the supersonic version of HF-2, which could accelerate to low supersonic speed (Mach 1.5) in final dash, thus increase its chance to kill the target. Development was rumored finished, and some older HF-2 was being replaced with the new supersonic HF-2. But this supersonic HF-2 version is believed to be a myth. Some HF-2 batteries are located on Taiwan's outlying islands, with others fitted on naval vessels. These missiles have had their radars and IR seekers replaced with GPS guidance units and TV/IR seekers for terminal guidance. This is designed to serve as a deterrent to mainland China, and will continue to do so until CSIST completed development of the HF-2E. As with the above, however, the existence of a land-attack version of the HF-2 anti-ship missile is unconfirmed, and media reports claiming the new missiles have a range of between 1000 and 2000 miles have been dismissed by the Ministry of National Defense as "sheer fabrication[s]." In late 2014, CSIST reportedly began the test-launching stage of an extended-range version of the HF-2, increasing range from 160 km (99 mi) to 250 km (160 mi); the range increase was successfully achieved by February 2017. This page was last edited on 22 September 2018, at 02:52 (UTC).